We live in an exciting time for work. Instead of three or four big vendors providing end-to-end software suites, we have a variety of top notch products at our fingertips ready to make us more powerful and productive in our jobs. But all of these great products come with a small cost: the tools we use every day don’t always play well together. Progress and productivity can end up in silos instead of being reviewed and tracked by the whole team. The Slack Platform aims to make your experience with apps even better. We know that just a fraction of improvement in everyday interactions between the business services you use makes a world of difference. And so today we’re taking a few bigs steps forward in bringing them all together. 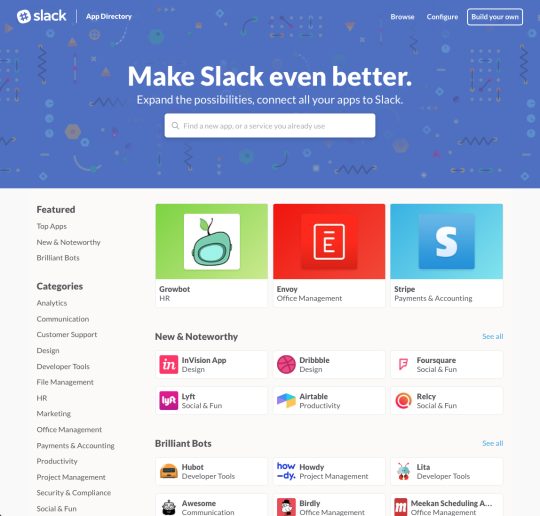 First up, our brand new Slack App Directory, where you can find over 160 apps that can extend the capabilities of your Slack team, sorted into curated lists by category, popularity, and staff favorites. Installation is easy — you’ll be using these new apps inside your Slack team after just a few clicks. There are listings from a variety of categories such as design, marketing, office management, developer tools, and productivity. No matter what kind of team you’re on, we have apps ready to make your team more productive. You can even search for apps from within Slack itself, by typing /apps <keyword> to search for any app related to that <keyword> and get the 3 most popular results back in your channel. But that’s not all: to support and encourage developers to build apps that interact with Slack, we’ve announced a new $80 million dollar fund backed by Slack and six of our investors: Accel, Andreessen-Horowitz, Index Ventures, KPCB, Spark, and Social Capital. If you’re a developer or small company deciding whether to make a bet on the Slack platform, the Slack Fund is a new source of support to help you get started building apps. The Slack Fund will fund both “Slack-first” apps as well as B2B and enterprise tools that make Slack integrations a core part of their offering. We expect our portfolio to feature a diverse array of entrepreneurs working on solving problems for teams in every industry, function, and corner of the world. We’ll measure the success of the Slack Fund in the quality and adoption of the apps built by Slack Fund companies and by the overall investment we see in the Slack ecosystem. Finally, we’re happy to announce the launch of a new framework for Slack development called Botkit by the folks at Howdy. It greatly simplifies the creation of apps (especially bots) with a flexible codebase that handles things like authenticating apps to a team and the sending, receiving, and processing of messages with our API. With Botkit, developers can stop reinventing the wheel on basic functionality and instead get a head start on writing code for what their bots actually do and how their apps interact with Slack. Botkit will also provide a simplified way for new developers to get into programming for Slack by building off the impressive collection of tools available in it. There’s a lot to be excited about in these three announcements. The App Directory will become the place to find apps that let your team work smarter and faster in Slack. The Slack Fund will ensure a wide range of new apps from a variety of developers will get built and launched thanks to this new financial backing. Botkit will greatly simplify Slack programming and give us a world where a thousand bots can bloom. Today’s announcements are both an investment into the future of Slack apps and an investment in the developers that help create these tools. We can’t wait to see what everyone does with these newfound resources. If you’d like to begin developing apps for Slack check out our API documentation and if you’d like to learn even more our Developer blog post about the announcements has in-depth technical information.